Our Vision is to be a world class school, giving the best care, support and outcomes to our students. Working closely with parents, we work towards developing the successful citizens of our future. Our Values are based on the teachings of Christ. We are inspired to learn and bring these values into our everyday lives in the service of each other, the parish, diocese and society. St. Mary's students, staff and governors have been reflecting on the values which we feel are important to us as a school. We have based our core values on the Beatitudes, and each area has been looked at in assemblies and prayers. Below you will see a summary of the values we feel are central to our mission, here at St. Mary's Menston. In September, each of our Year 7 pupils are given a badge with their form's value and colour. 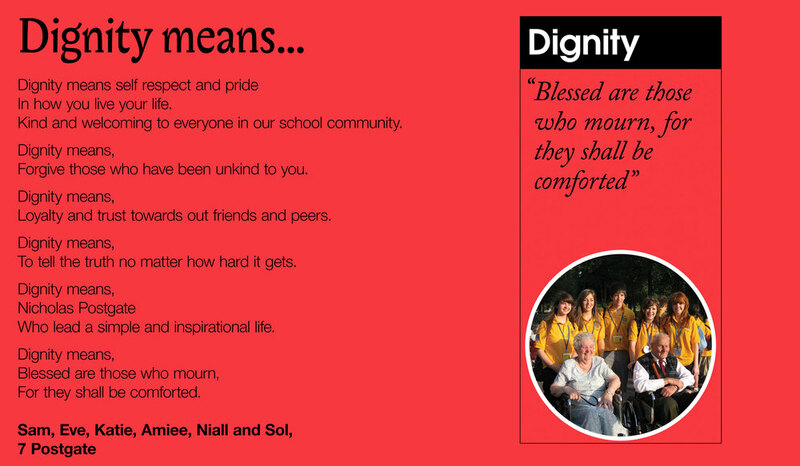 7 Postgate wrote about what 'dignity means' to them.